I am struggling to categorise this rather excellent book. On the face of it is sci fi with the main action taking place on a distant outpost called Oasis but in reality its a hauntingly evocative book about faith and love. The tale is set in the near future with Peter, the central character, transported billions of miles to Oasis to serve as a missionary to the indigenous population. He leaves behind him Bea, his wife with whom he corresponds by "shoot" which is a basic form of word only e-mail. 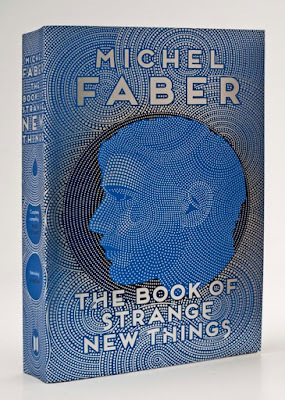 The imagery offered by Faber is exquisite and whilst the plot is slow the description is compelling and its as hard not to engage with this strange new planet as it is to put the book down. All the way through you are wondering what its all about and what lies behind the motivation of the shadowy organisation who manages the operation. But in some ways the story line isn't about life on Oasis, or the strange inhabitants who are so hungry to hear the Gospel of Jesus, or indeed why satisfying this desire is so crucial to the non believing human colonists. In fact the real story is about the love between Peter and Bea which is stretched to the limits as the world at home falls to bits and the limits of their written communications cause their relationship to start to crack. There are times when you can hardly bear to read another of their missives as as everything comes unglued. I always find it hard to read / watch stories of relationships failing, and the limitations of their written communication remind me of the stresses of maintaining our own long distance relationship before we married all those years ago. Whilst one party is set in sci fi land, the tensions between the two central characters is very down to earth and reflects the pressures which exist where one party is removed for long periods of time - the armed forces come to mind. Don't be put off by the Sci Fi veneer - thats just geography which allows Faber to explore faith set in different contexts. This is a "thinking" book with depth and gravitas - intensely gripping and good fodder for the book group. There have been no boat movements to report for the last couple of months for the simple reason that both boats have been moored up at Longwood Boat Club undergoing a serious refit before we set off on out six month cruise next year. During that time there have been some coming and goings at the club which has meant that the butty has ended up moored immediately behind the motor, just as it should be. 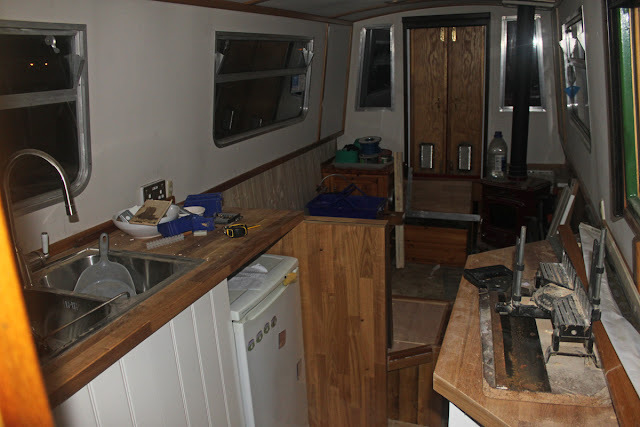 The last two months have focused on the motor with the galley being stripped out along with the saloon, leaving just the fire I installed last winter and a couple of drawers opposite. It was rather sad seeing the entire main cabin stripped back to the paneling, which has grown old and dark, a sharp contrast to the light airy feel it had when we bought it 10 years ago. The panels above the gunnels were sanded back and then painted an off white with new oak strip added to give it renewed freshness. Then the work started in earnest with a new kitchen from Ikea being installed. 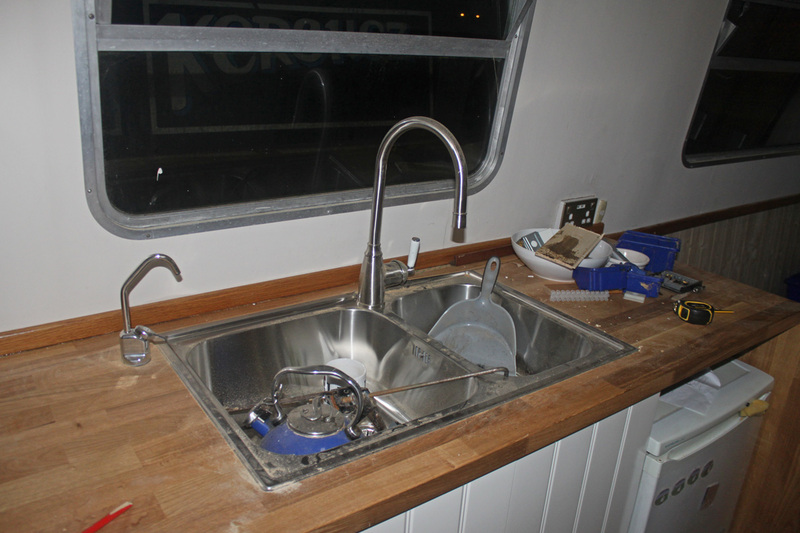 Of course, there were not many actual units, just the base for the sink and a thin one on the other side. All the rest was bespoke made out of end panels and other odds and ends which fitted the space available. One significant change has been to raise the work surfaces by about 4 inches, which make them just the right height for us - a real novelty! 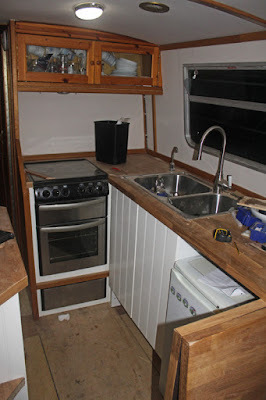 All the pipes were a challenge as standard fittings had to be adapted to fit the boat plumbing. The greatest challenge was to reduce a huge waste outlet from the sink to a 1 inch pipe through the skin fitting. With a bit of help from a plumber friend involving a bung, some 22mm pipe, some silicone and some jubilee clips I managed to achieve a water tight fit. The project includes a 36 litre 12 v freezer from Webasto which fits under the new L shaped settee. Its all in place sitting on the base plate but as yet its not wired in. That will have to wait till I have added two more batteries to give us greater power reserves and a couple of solar panels to keep them charged up. 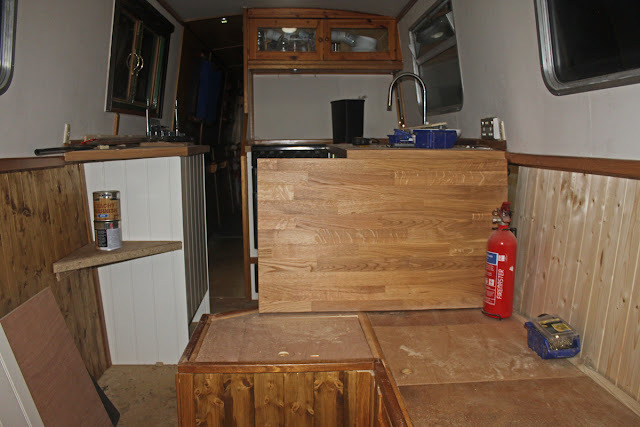 The next task is to fit an oak floor and then we will be ready to order the cushions and blinds. All this haste is necessary because we have an extension being started on our house in a few weeks and we need somewhere to go when the kitchen is taken out of service. The countdown to next season is well underway with just 50 working days to go before I leave on 12th April. More photos as things progress. During the Christmas trading period we attended an event at Curborough and among the stall holders was one selling specialty beer. As you can imagine, all the jewelry and trinkets hold little appeal but beer, well now you are talking my language. I decided to buy half a dozen beers for Christmas, six light and six dark and to record my findings. Sadly I weakened 10 days ago and drank one and have forgotten which one it was! 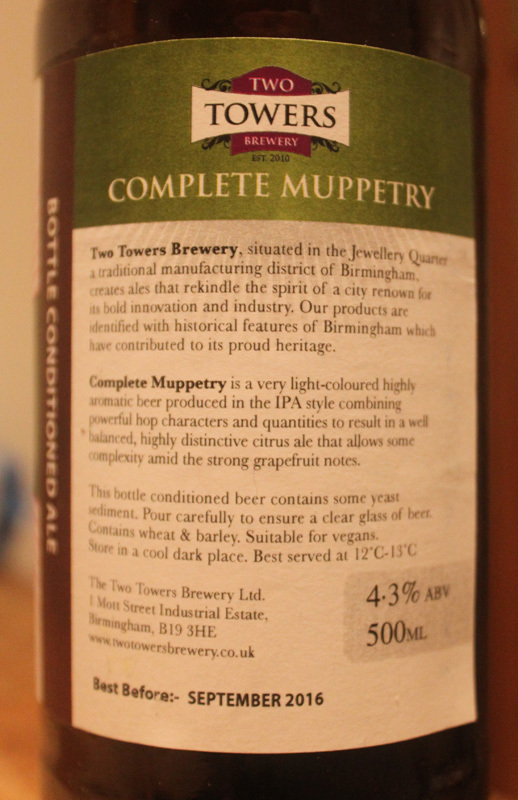 Tonight, after a walk over Essex Bridge at Great Haywood we returned home and decided to crack open a bottle or two, starting with Two Towers Complete Muppetry, a 4.3% IPA. This is an outstanding craft beer brewed in the Jewelry Quarter. It has a strong hop flavour, quite citrusy and tangy, a perfect compliment for turkey curry. 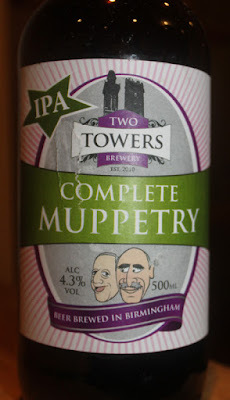 Fortunately, I have bought several beers from Two Towers and am looking forward to sampling their range. I think this may be the start of a long friendship. I would like to say a big thank you to all the Business Boaters that voted for me in the recent C&RT elections. I am pleased to announce that I was successful on this, my second attempt to win a seat on the Council. The first meeting is in March 2016 and I will do all I can to ensure that the needs of the Business Boating community are fully represented. With the elections over I will start to post my blog entries again.